Welcome! We are a fishing guide service offering guided fly fishing trips in the Santa Fe, Chama, and Taos areas as well as on the San Juan River and in the Valles Caldera National Preserve. All Fishing Gear ProvidedAll the fly fishing gear you will need (Sage and Orvis rods & reels, custom tied flies, wading gear, etc.) is provided on all of our fishing trips, at no additional cost. We offer transportation to and from most of the fishing spots we go to. Day trips include great lunches, drinks and snacks. 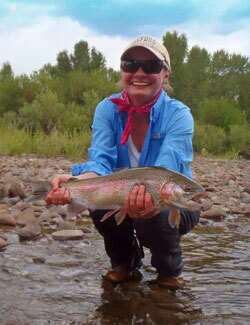 Our all inclusive Fly Fishing Packages also include all meals and lodging. Our experienced fly fishing guides can take you trout fishing on all types of waters - from large rivers to high mountain spring creeks and lakes, we have them all here in Northern New Mexico and Southern Colorado. The landscape is breathtaking and extremely diverse, with everything from deserts, canyons and mountains with alpine forests of pines and aspen to mesas of cactus and juniper. There is excellent fishing all year-round, with lots of fish to be caught. 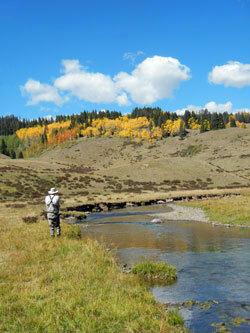 New Mexico is truly western fly fishing's "Land of Enchantment". 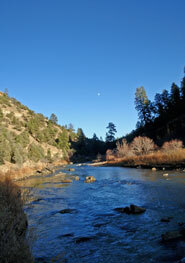 Land of Enchantment Guides is permitted for guided fishing trips by the Santa Fe National Forest, the Carson National Forest, the New Mexico State Parks, the Federal Bureau of Land Management and the Valles Caldera National Preserve. 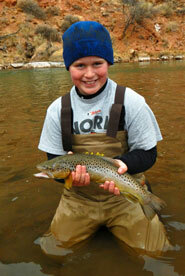 We are also a permitted guide service/outfitter in Colorado (permit #: OUT-2808). All of our guides are certified in CPR/AED and basic first aid and, we are fully insured and bonded. 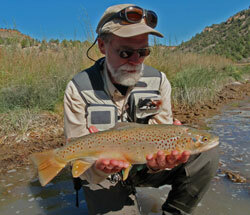 Please look through our website and photo galleries to get a better idea of what an amazing experience fly fishing for trout in New Mexico can be. Feel free to contact us at anytime, if you have any questions, need more information or if you would like to book a fly fishing trip. 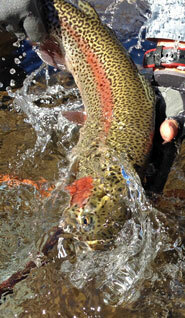 a large rainbow trout hooked on a mouse pattern/dry fly.